Toronto is a booming metropolitan state that as a large concentration of companies and business organization located within its core. This heavy concentration as led to the creation of numerous of opportunities for more than 5 million people who reside and work in the state. 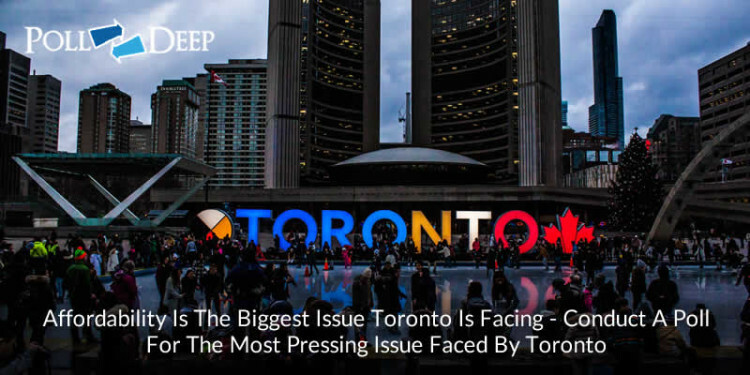 In a bid to understand the most pressing issues they faced living and working in Toronto, a poll was carried out on over 2,500 residents. This poll revealed that people living in Toronto complained about things not being affordable in the state. They said the rising cost of living is making life difficult and very expensive within the metropolitan state. Our participants were quizzed on a broad list of topics, and the following results was what they believe to be the problem and the most pressing issue they face by living in Toronto. In order to bring this affordability issue into perspective, we will take the Toronto housing crises as a case study. According to research carried out on the prices of various types of condos in the state, we found out that while rent prices have gone up almost over 47% in Toronto since the late 2000s, average wages have only increased by a mere fraction of 10%. This price gap is causing lots of civil unrest within the city as more and more people need to take up 2 to 3 jobs just to keep up with monthly bills and expenses. Others have resulted to squatting or having roommates in order to be able to afford a house. When our participants were asked on what they believe to be the cause of this rising cost of living, almost 65% of them blamed it on the government who they believe are not doing enough to better the lives of individuals living in the state. 20% blamed it on the high influx of visitors from neighboring states who are looking for job opportunities and to get that downtown experience they usually see in the movies. 25% however blamed it on the large concentration of companies and business organizations inside Toronto downside core. According to 65% of our participants, they believed that relocating most of these business, companies and various organizations from the core of the state to the outskate of the state or to other neighboring state can really help in reducing the amount of pressure being put on the various public infrastructures, reduce the high level of immigration into the state and help fight the high cost of things in the state. Even with these problem of affordability, more and more luxury condos are being built all around the state as the demand for high end condos by the extremely rich keeps on increasing. This large amount of multi-millionaires taking up residence in the state is believed to be causing more problems as the prices of goods and services keep on increasing in order to match their large spending.